Lilac Co is more or less a vehicle for Lewis’s experimental performance work; all of their productions are created, written, and directed by him and involving a variety of different collaborators through the years. He also typically performs in his own pieces, which involve abstract language, non-linear storytelling, and an awareness that the performers are onstage performing. When I asked him about his gravitation toward Greenpoint, his reaction was similar. “It wasn’t formal, just necessity,” he says. However, he notes the convenience of settling in one neighborhood; he does now have a relationship with all the 99-cent stores nearby, and there’s a coffee shop he prints his plays at. He currently resides with Campbell in a small studio there that he also uses as a rehearsal space, but unlike his previous locations, the landlady will not permit him to do any shows in the space. After a 2014 incident where she called the police three times during a performance, he’s staying on the safe side. However, Campbell feels that this DIY mentality vibes well with the work Lilac Co makes. The mission on their website states, “Make it with what you have,” so I cannot help but agree. I do a bit of a double take. Blackface was a common sight on stages many decades ago, but nowadays it’s essentially forbidden, for the obvious reason that it’s largely racist. There are some groups who have attempted it in ways that have been deemed acceptable, such as Branden Jacobs-Jenkins’s An Octoroon, which was written by a playwright of color and inspired by a racist play from 1859. Performance collective The Wooster Group, who Lewis later cites, also used it in their controversial production of The Emperor Jones, which has polarized audiences for over 15 years. Here, we have two white people contemplating using it. This will be interesting. I press for more information regarding the choice and why they did not make moves to cast an actor of color in the piece instead. “Well, it’s still a question mark about whether or not we’re going to do it at all, even with the performance coming really close. To talk about it is one thing, but when you start doing it everyone gets freaked out. I want to sort of experiment with the history of white actors doing Shakespeare. Because I was fascinated by Orson Welles’s  ,, and he’s in blackface in the not-too-far past. So I’m just going to wear their robes and sort of feel how it feels. But we’re in such a different time and place that it doesn’t really translate,” he says. “We can only speak for ourselves,” added Campbell. 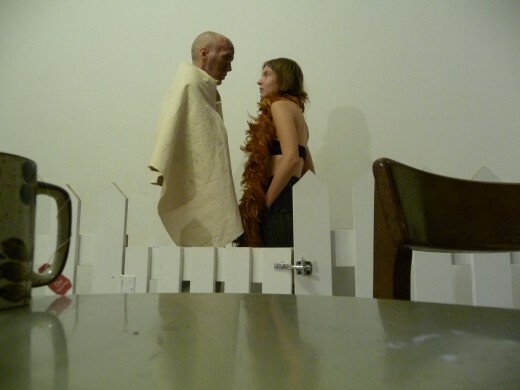 Lewis and Campbell in AfterOthello at Secret Project Robot, June 2015. Othello’s race remains a topic of debate for Shakespearean scholars. He is described in the play as a “Moor,” an antiquated term for Muslim that came to refer generally to dark-skinned people, but the role has been played historically by many races, in and out of blackface. Scholastic inquiry, however, becomes slightly irrelevant when considering Lewis and Campbell are not doing a traditional production of Othello, but a piece that is decidedly theirs. The script itself, riddled with fragmented and verselike phrasings like “Killed a black man / Who’s not a black man / Who’s a white man / Who’s dead” references the use of blackface, potentially dabbles in the story of a couple playing sexual “Othello games” and ends in a version of the Iago character as a cop who ultimately shoots the blackface Othello character, raising the ambiguity of whether he has shot a black man or a man for being in blackface. The two of them seem very aware that this is not a choice to be made lightly. Ultimately, they’ll make a choice and show it to an audience and reap the reactions, whatever they may be. Lewis even hopes that this tension will be present in the piece, as their work is largely self-aware, the type of thing where they’ll technically be playing characters but simultaneously make it clear they they are also themselves. “It’s like a poetic response to the whole narrative of Othello, all these issues. So it’s us not answering these questions but responding poetically and dealing with all that dissonance as performers in that situation,” he says. This art/life boundary begins to blur even while I’m sitting in the studio with them. “This was never… This isn’t what I wanted,” Campbell continues. 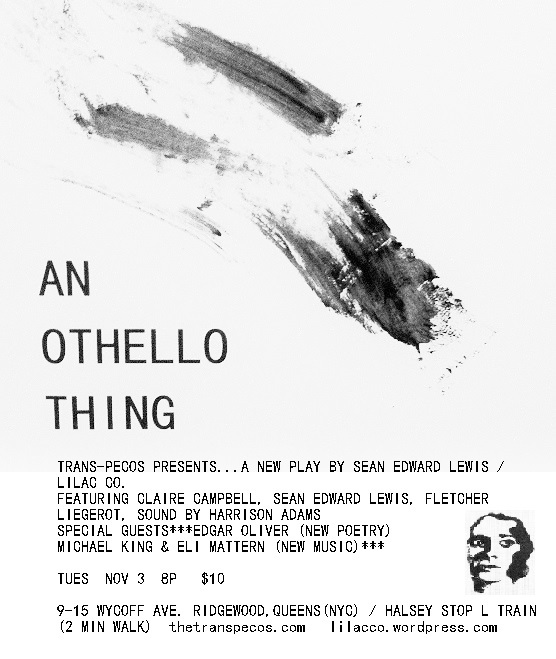 Lilac Co.’s work-in-progress presentation of AN OTHELLO THING happens Tuesday, November 3rd at Trans-Pecos, 9-15 Wyckoff Avenue, Ridgewood. 8pm. Tickets are $10. It is written and directed by Sean Edward Lewis, featuring Sean Lewis, Claire Campbell, and Fletcher Liegerot. More info here.